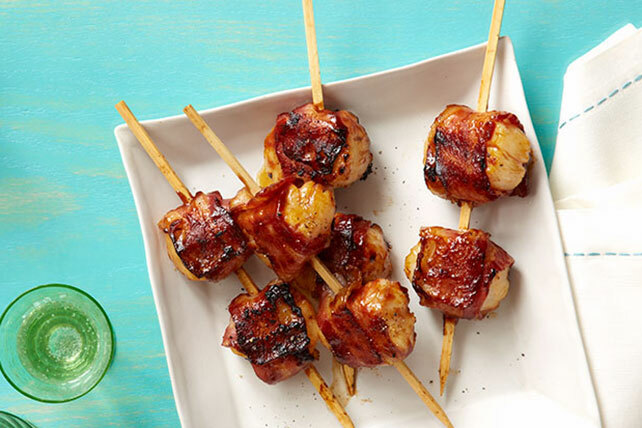 Grab some bacon-wrapped scallops if you think anything is better with bacon! Sprinkled with pepper, BBQ Bacon-Wrapped Scallops are a delicious bacon dish. Place bacon on paper towel-covered microwaveable plate. Microwave on HIGH 2-1/2 min. or just until bacon starts to cook but is not crisp. Cool slightly. Wrap 1 bacon slice around each scallop. Thread 2 scallops onto each of 4 skewers. Grill 7 to 8 min. or until scallops are done and bacon is crisp, turning frequently and brushing with barbecue sauce. Transfer to platter; sprinkle with pepper. If using wooden skewers, soak them in water 30 min. before using to prevent them from burning on the grill.